Included: Twin-sharing bed and breakfast hotel accommodations in Kathmandu, airport transfers in Nepal, sightseeing as specified, trek lodging and three meals a day, trekking guide and staff, national park fee. Not Included: International flight, airport taxes, Kathmandu-Lukla-Kathmandu flight, Nepal visa fee, hotel/meals in Bangkok, etc (see subsequent literature). Climbing gear and sleeping bag. Every hiker’s dream is to stand face to face with Mt. Everest. On this trip, your dreams will come true. Three of the highest peaks - Mt. 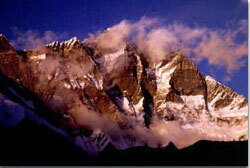 Everest, Lhotse and Cho-Oyu guard this holy sanctuary of the Himalayan gods. Ornate monasteries are bestowed with colorful prayer flags; carved prayer mani stones line the trails; and an unbending faith in traditional values embrace this Sherpa world. 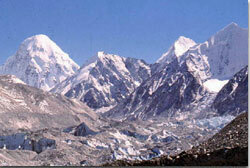 Climb Kalapathar (18,190’) for a stunning view of Everest and other major peaks. An added highlight of Autumn trip is attending the Mani Rimdu festival at Tyangboche. These colorful and festive celebrations are the culmination of ten days of prayers on the Buddha of compassion, Chenrezig. The prayers will be said over many days, They are done for the benefit of all beings. But for the villagers the most important part is when they receive the blessings from Rinpoche (high lama), and when the monks perform the masked dances for an entire day. After this the whole village gets together in the evening and dances until late in to the night at Tyangboche. Day 3 - Morning flight to Lukla (9200’). Trek to Phakding (8800’). Enjoy Sherpa hospitality and sample some “Sherpa stew,” sure to warm you up! 3-4 hrs. Day 5 - In Namche: Spend a day acclimatizing, visiting the Sherpa culture museum and national park center. Optional day hike to Everest View Hotel (12,500’). Day 6 - Trek to Tyangboche (12,900’): Hike far above the Imja Khola (river) where giant vultures soar, through Rhododendron forests to Tyangboche Monastery, tucked majestically beneath Ama Dablam. Learn about Tibetan Buddhism on a guided tour of this impressive center of learning. 5 hrs walk. Day 7 - Attend Mani Rimdu festival at Tyangboche: Colorful and festive celebrations with local people from different villages who gather for Mani Rimdu. Dancing monks perform the masked dances for day. Sherpas from different villages celebrate the end of Mani Rimdu in the evening and dance until late into the night. Day 8 - Trek to Dingboche (14,000’): Begin the day amidst the spring flowering Rhododendrons before leaving forest behind and entering high altitude Chukhung valley. An overnight here helps you acclimatize. 5 hrs. Day 9 - Trek to Lobuche (16,400’): Now with views of Nuptse and Lhotse in front, ascend gradually to Lobuche. Prepare for a spectacular sunset view on the peaks. From here, you can see the undulating marine sediments atop Nuptse. 5-6 hrs. Day 10 - Day hike to Kalapathar (18,190’) and back to Lobuche: Rise early to beat the clouds for a breath-taking view of Mt. Everest (Sagarmatha in Nepali). Look down on Everest Base Camp and the giant Khumbu glacier. For those with extra energy, take a side trip to Base Camp. 6-7 hrs. Day 11 - Optional day hike to Everest Base camp (17,000’) and back to Lobuche. En route, notice the unearthly ice shapes known as ice seracs, as you trek along the Khumbu glacier. Or, take a deserved rest day and explore Lobuche. 9 hrs. Day 12 -Trek to Pangboche (13,000’): Reverse your steps, and proceed down to Pangboche, a traditional potato-farming village with a centuries old monastery and gigantic carved mani (prayer) stones linking the trail. 5 hrs. Day 15 - Morning flight to Kathmandu: Enjoy the rest of the day in Kathmandu, shopping, massage, or just relaxing.